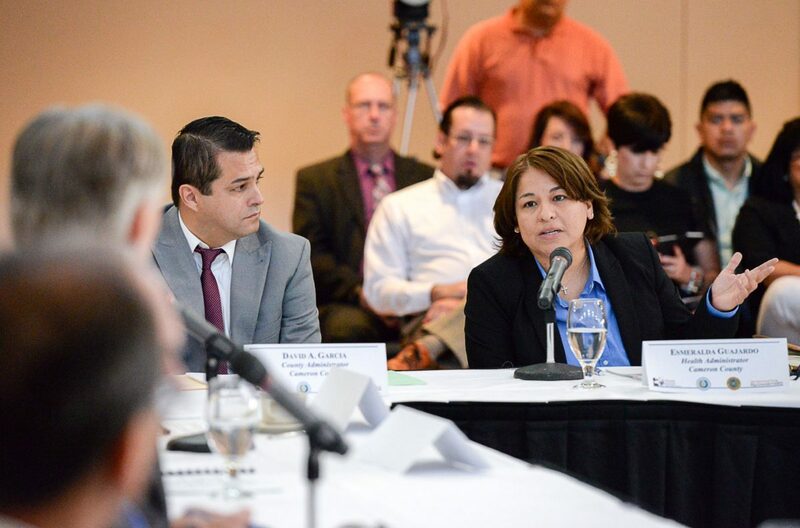 Cameron County Health Administrator Esmeralda Guajardo addresses Texas Governor Greg Abbott during a roundtable discussion of the Zika virus at the University of Texas Rio Grande Valley on Friday, May 5, 2017, in Brownsville, Texas. Gov. Abbott discussed the need to prevent the virus by targeting the mosquito population and also received input from local leaders and health officials. Brownsville was home to the first mosquito-borne transmission of the Zika Virus in November 2016. BROWNSVILLE — Gov. 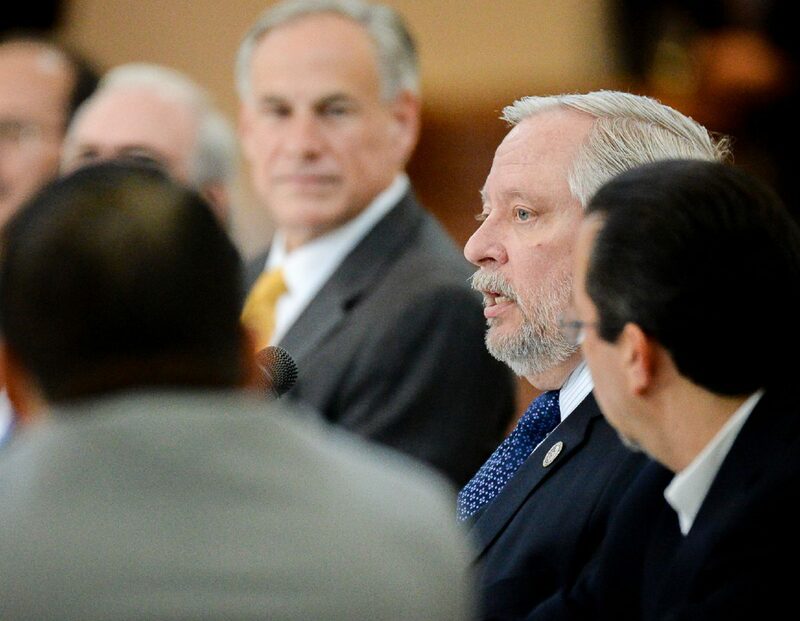 Greg Abbott and Texas Department of State Health Services Commissioner John Hellerstedt were in Brownsville on Friday to deliver an emphatic message to local officials: Get the jump on Zika before it gets the jump on us. 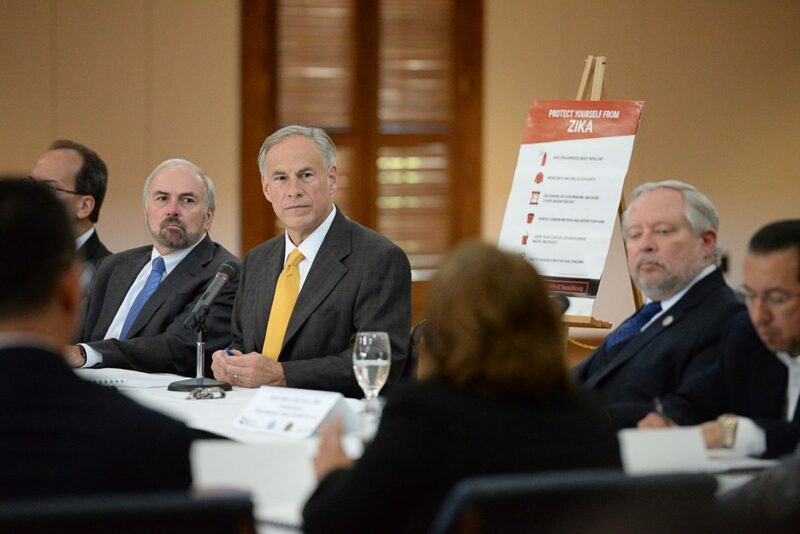 More than two dozen officials from Rio Grande Valley law enforcement agencies, municipal and county governments, public school districts, higher education and health agencies gathered on the University of Texas Rio Grande Valley campus in Brownsville for a Zika roundtable discussion hosted by UTRGV President Guy Bailey. Zika is a mosquito-borne virus that can cause fever, rash, muscle and joint aches, and conjunctivitis, or “pink eye,” according to DSHS. Symptoms are typically mild, and the majority of those exposed to the virus never develop symptoms. However, Zika also has been linked to microcephaly, a birth defect, as well as other problems for babies born to mothers who were infected with the virus while pregnant. The virus is spread by the mosquito species Aedes aegypti , which breeds in shallow water. Zika also can be spread through sexual contact. 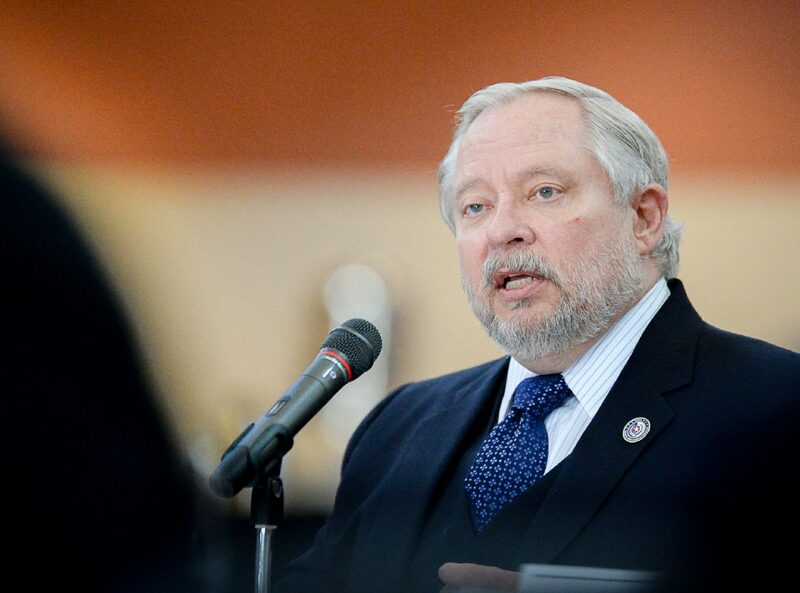 Texas Department of Health Services Commissioner Dr. John Hellerstedt speaks at a Zika Virus roundtable at the University of Texas Rio Grande Valley on Friday, May 5, 2017, in Brownsville, Texas. Gov. 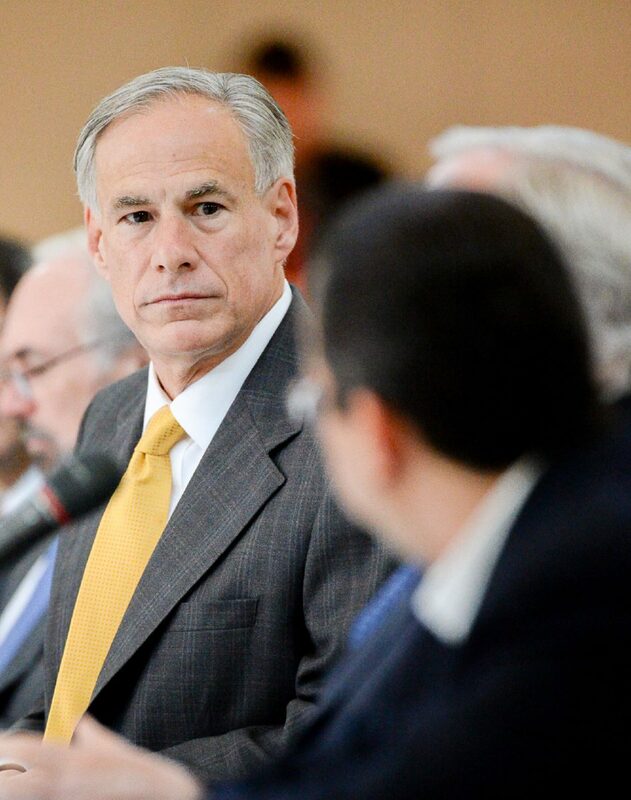 Abbott spoke about preventing the spread of the virus and heard concerns from local leaders and health officials regarding mosquito-vector control. Brownsville was home to the state's first mosquito-borne transmission of the virus in November 2016, which can be sexually spread and cause birth defects in unborn children. Texas Governor Greg Abbott listens to input from Cameron County Health Administrator Esmeralda Guarjardo during a Zika prevention roundtable at the University of Texas Rio Grande Valley on Friday, May 5, 2017, in Brownsville, Texas. The Texas Department of State Health Services reported the state's first mosquito-borne case of the Zika Virus in Brownsville in November 2016, prompting action by local leaders who were able to have an open discussion with Gov. Abbott related to concerns over the virus. DSHS says 322 Zika cases were reported in 2015 and 2016 in Texas. As of April 28, 11 cases had been reported, two of them in Cameron County. Hellerstedt said last year’s Zika season started late, fortunately, though he expects 2017 will soon “pick up where we left off.” A longer season this year will tax resources, Hellerstedt said. Abbott said every resident has a role to play in helping prevent the spread of Zika — getting rid of standing water in the yard, for instance — but stressed to the gathered officials that it’s their responsibility to ensure an effective, coordinated campaign of vector control. Part of that means doing a better job educating the public and local leaders, he said. Planning needs to start now to prevent or mitigate an outbreak rather than waiting until one has already occurred, he said. Since Zika spreads through human travel, DSHS recommends travelers to countries and regions with high incidences of Zika transmission — Latin America, the Caribbean and some Pacific islands — to avoid being bitten by mosquitoes while abroad and for 21 days after returning to the United States. Mosquito bites can be prevented by applying EPA-registered insect repellents, wearing long pants and long-sleeved shirts to cover exposed skin, using screens and keeping windows and doors shut to keep mosquitoes out of the home, removing standing water in and around the home, and covering trash cans or other containers where water can collect. Hellerstedt said the fact that most people infected with the virus don’t show symptoms makes it “very sneaky and difficult to deal with.” Blood testing is the best way to know where a Zika outbreak is occurring, he said, which is why DSHS is calling for routine testing of all pregnant women in Cameron and other South Texas counties. For more information, visit www.texaszika.org.